Huawei is a leading global information and communications technology (ICT) solutions provider. Our aim is to enrich life and improve efficiency through a better connected world, acting as a responsible corporate citizen, innovative enabler for the information society, and collaborative contributor to the industry. Driven by customer-centric innovation and open partnerships, Huawei has established an end-to-end ICT solutions portfolio that gives customers competitive advantages in telecom and enterprise networks, devices and cloud computing. Huawei's 170,000 employees worldwide are committed to creating maximum value for telecom operators, enterprises and consumers. Our innovative ICT solutions, products and services are used in more than 170 countries and regions, serving over one-third of the world's population. Founded in 1987, Huawei is a private company fully owned by its employees. For more information, please visit us online at www.huawei.com. For more than 11 years, Amazon Web Services has been the world's most comprehensive and broadly adopted cloud platform. AWS offers over 100 fully featured services for compute, storage, databases, networking, analytics, machine learning and artificial intelligence (AI), Internet of Things (IoT), mobile, security, hybrid, and application development, deployment, and management from 52 Availability Zones (AZs) across 18 geographic regions in the U.S., Australia, Brazil, Canada, China, France, Germany, India, Ireland, Japan, Korea, Singapore, and the UK. AWS services are trusted by millions of active customers around the world--including the fastest-growing startups, largest enterprises, and leading government agencies--to power their infrastructure, make them more agile, and lower costs. To learn more about AWS, visit https://aws.amazon.com. webOS is a web-centric and usability-focused software platform for smart devices. The operating system has constantly evolved, passing through its journey from Palm to HP, and most recently to LG Electronics. Now, LG Electronics is releasing webOS as an open source project, named webOS Open Source Edition (OSE). DigitalOcean is the world's fastest growing cloud hosting provider built for developers. Our mission is simple: we're passionate about making complex infrastructure simple and delighting our customers with a seamless experience that brings them joy. New users can easily deploy a blazing fast cloud server in 55 seconds with an intuitive control panel interface, which can be replicated on a larger scale with the company's straightforward API. As the world's number 1 job site, our mission is to help people get jobs. Every month, over 200 million people around the world use Indeed in their job search. Our teams solve challenging problems with creative solutions to make this happen. We release open source solutions and share accomplishments and learnings. 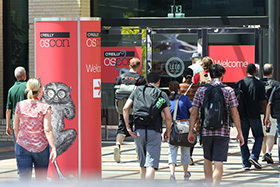 We have bold goals for our open source program and are looking forward to all the great conversations at OSCON 2018. Pivotal Software, Inc., combines platform, tools, and methodology to help the world's largest companies adapt to change and deliver exceptional user experiences. Our technology is used by millions of developers. Fortune 500 companies build and run their most important applications on our cloud platform. Launched in 2013, Pivotal unleashes software-developer productivity, and creates an environment for innovation to scale, while fulfilling our mission to transform how the world builds software. Pivotal investors include Dell, Ford, GE, Microsoft, and VMware. With more than $2 billion in revenues, CDK Global (Nasdaq: CDK) is a leading global provider of integrated information technology and digital marketing solutions to the automotive retail and adjacent industries. Focused on enabling end-to-end automotive commerce, CDK provides solutions to dealers in over 100 countries around the world, serving approximately 28,000 retail locations and most automotive manufacturers. CDK solutions automate and integrate all parts of the dealership and buying process from digital advertising and marketing campaigns to the sale, financing, insuring, parts supply, repair, and maintenance of vehicles. CDK has offices in Chicago, Portland, Seattle and Austin. Visit cdkglobal.com. Heptio customers make giant leaps in development productivity and resource efficiency. We provide the products, services and community projects that organizations need to unlock the full potential of upstream Kubernetes. It's all neatly packaged in the Heptio Kubernetes Subscription with all the essentials needed to deploy, manage and support an open source Kubernetes distribution across multiple clouds. StackPath is a platform of secure internet services built at the cloud's edge. StackPath services enable developers at organizations of any size to build protection and performance into any cloud-based solution—from SaaS to web publishing, gaming, media streaming and beyond—without needing cloud security and delivery expertise of their own. StackPath uses and supports free and open source software and donates more than 2 petabytes (PB) of free bandwidth per month, speeding up more than 6 million websites. Headquartered in Dallas, Texas, StackPath has offices across the U.S. and around the world. About Elastic Elastic builds software to make data usable in real time and at scale for search, logging, security, and analytics use cases. Founded in 2012, the company develops the open source Elastic Stack (Elasticsearch, Kibana, Beats, and Logstash), X-Pack (commercial features), and Elastic Cloud (a SaaS offering). To date, there have been more than 225 million cumulative downloads. Backed by Benchmark Capital, Index Ventures, and NEA with more than $100 million in funding, Elastic has a distributed workforce with more than 800 employees in 30 countries. Learn more at elastic.co. Redis Labs, home of Redis, the world's fastest in-memory database platform, provides Redis Enterprise, as a cloud service and as a software, to over 8,000 enterprise customers. The high performance, true high availability, seamless scaling of Redis Enterprise, are top-ranked by industry analysts, power use cases such as high speed transactions, queuing, user session stores, caching, in e-commerce, personalization, IoT, fraud detection and other real-time applications. Redis, voted the most loved database, rated the #1 cloud database, #1 database on Docker, #1 NoSQL datastore, and fastest growing NoSQL database reduces application complexity, simplifies development, and provides unprecedented flexibility to developers. Rogue Wave Software helps thousands of global enterprise customers tackle the hardest and most complex issues in building, connecting, and securing mission-critical applications. Since 1989, our platforms, tools, components, and open source support have helped financial services, healthcare, automotive, government, and manufacturing deliver value faster and reduce risk. Our OpenLogic stacks and support provide expert-curated and orchestrated open source infrastructure, designed for enterprise performance, to modernize legacy systems and bring your enterprise to open source scale. Stack Overflow is the largest, most trusted online developer community for developers to learn, share their knowledge, and build their careers. More than 50 million professional and aspiring programmers visit Stack Overflow each month to help solve coding problems, develop new skills, and find job opportunities. Founded in 2008, Stack Overflow partners with businesses to help them understand, hire, engage, and enable the world's developers. To learn more about Stack Overflow's business solutions - technical recruiting, advertising, market research, and enterprise knowledge sharing visit stackoverflowbusiness.com. Founded in 1999 and based in San Mateo, California, SurveyMonkey is the world's leading platform for turning people's voices and opinions into actionable data — People Powered Data. Whether it's with customers, employees, or a target market, SurveyMonkey helps curious individuals and companies — including 99% of the Fortune 500 — have conversations at scale with the people who matter most. It's People Powered Data that allows them to understand not only "what" is happening, but "why." SurveyMonkey's 700+ employees throughout North America, Europe, and Asia Pacific are dedicated to powering the curious. CenturyLink is the second largest U.S. communications provider to global enterprise customers. With customers in more than 60 countries and an intense focus on the customer experience, CenturyLink strives to be the world's best networking company by solving customers' increased demand for reliable and secure connections. The company also serves as its customers' trusted partner, helping them manage increased network and IT complexity and providing managed network and cybersecurity solutions that help protect their business. The Cloud Foundry Foundation's mission is to establish and sustain Cloud Foundry as the global industry standard open source PaaS technology with a thriving ecosystem; to deliver continuous quality, value and innovation to users, operators and providers of Cloud Foundry technology; and, to provide a vibrant agile experience for the community's contributors that delivers the highest quality cloud-native applications and software, at high velocity with global scale. The IEEE Standards Association (IEEE-SA), a globally recognized standards-setting body within IEEE, develops consensus standards through an open process that engages industry and brings together a broad stakeholder community. IEEE standards set specifications and best practices based on current scientific and technological knowledge. The IEEE-SA has a portfolio of over 1,250 active standards and more than 650 standards under development. Learn more at http://standards.ieee.org. Since its inception in 1991, Linux has grown to become a force in computing, powering everything from the New York Stock Exchange to mobile phones to supercomputers to consumer devices. The Linux Foundation is the nonprofit consortium dedicated to fostering the growth of Linux. Founded in 2000, the Linux Foundation sponsors the work of Linux creator Linus Torvalds and is supported by leading technology companies and developers from around the world. The Linux Foundation promotes, protects and advances Linux by marshaling the resources of its members and the open source development community to ensure Linux remains free and technically advanced. Dyn is an Oracle Infrastructure-as-a-Service (IaaS) global business unit (GBU). Oracle's Dyn is a pioneer in DNS and a leader in cloud-based infrastructure that connects users with digital content and experiences across a global internet. Dyn's solution is powered by a global network that drives 40 billion traffic optimization decisions daily for more than 3,500 enterprise customers, including preeminent digital brands such as Netflix, Twitter, LinkedIn and CNBC. Adding Dyn's best-in-class DNS and email services extend the Oracle cloud computing platform and provides enterprise customers with a one-stop shop for Infrastructure-as-a-Service (IaaS) and Platform-as-a-Service (PaaS). The Software Assurance Marketplace (SWAMP) is a publicly available, open source, no-cost service that provides continuous software assurance capabilities and static code analysis to developers. Using multiple tools to regularly scan software is the cornerstone of continuous assurance – the practice of integrating software assurance into the continuous cycle of software development. Offering 30+ static analysis tools and support for 10 programming languages, the SWAMP's high throughput computing infrastructure handles a large volume of assessments. Try the SWAMP on the web or download SWAMP-in-a-Box, a standalone application for on-premises software assurance. Plug-ins are also available for Eclipse, Jenkins, and Git/Subversion. WP Engine is the premium managed platform for websites and applications built with WordPress. WP Engine delivers the fastest, most reliable, and most secure web experience. Businesses large and small rely on WP Engine's exceptional customer service team specializing in quickly solving technical problems, and creating a world-class customer experience. Decred is an open-source digital currency with a strong focus on community input, open governance and sustainable funding and development. Its innovative blockchain utilizes a hybrid "proof-of-work" and "proof-of-stake" consensus system to ensure that a small group cannot dominate the flow of transactions or make changes to Decred without the input of the community. Its technology enabled the world's first successful direct on-chain consensus vote. Decred welcomes developers with different backgrounds to contribute and build out its ecosystem. Its sustainable funding and contractor model allows contributors to receive compensation directly from the project fund. The company maintains the free and open source Sensu Core framework as well as the commercially-supported Sensu Enterprise, which enhances the open source framework with features to simplify operations, governance, multi-datacenter support for fast-paced companies to run monitoring at scale. Sensu's software is the solution to the monitoring problems you're facing today, and the right foundation for your organization tomorrow. From bare metal to Kubernetes—get complete visibility across every system, every protocol, every time. Mojaloop helps accelerate the development of pro-poor payment systems by financial institutions and commercial providers. Mojaloop was created by the Bill & Melinda Gates Foundation in partnership with a group of leading tech and fintech companies: Ripple, Dwolla, Software Group, ModusBox, and Crosslake Technologies. Glucosio is an open source project dedicated to bringing open source apps to smartphone, desktop and web in order to help people with diabetes improve their health outcomes by better self-management of their disease. At the same time, Glucosio offers the opportunity for opt-in to crowdsourcing of anonymized health trends and demographics to support diabetes research. LinuxFest Northwest, an annual Open Source event co-produced by Bellingham Linux Users Group and the Information Technology department at the Bellingham Technical College. LFNW features presentations and exhibits on free and open source topics, as well as Linux distributions & applications, InfoSec, and privacy; something for everyone from the novice to the professional! OW2 is an independent community dedicated to developing open source code infrastructure (middleware and generic applications) and to fostering a vibrant community and business ecosystem. The OW2 Consortium hosts some one hundred technology projects, including ASM, Bonita, Chameleon, CLIF, DocDoku, Easybeans, Emerginov, Fractal, FusionDirectory, JOnAS, JORAM, JOTM, Knowage, LemonLDAP:NG, Lutece, OCCInterface, PetalsESB, Prelude, ProActive, RocketChat, SAT4J, Spagic, Spago4Q, Sympa, Talend Studio, Telosys, WebLab and XWiki. Visit www.ow2.org, follow us on Twitter @ow2. Founded in 2000, <b>The Perl Foundation (TPF)</b> is a non-profit 501(c)(3)corporation established to advance the use and development of the Perl programming language. By funding critical areas of Perl development, The Perl Foundation insures the continued growth and innovation of the language. The mission of the Python Software Foundation is to promote, protect, and advance the Python programming language, and to support and facilitate the growth of a diverse and international community of Python programmers. The PSF is a non-profit membership organization devoted to advancing open source technology related to the Python programming language. It qualifies under the US Internal Revenue Code as a tax-exempt 501(c)(3) scientific and educational public charity and conducts its business according to the rules for such organizations. Software Freedom Conservancy is a nonprofit charity that promotes and improves free and open source software projects. Conservancy is home to over 40 projects, including Git, Samba, Inkscape, phpMyAdmin, Racket and Selenium (to name a few). We are the home of Outreachy, a diversity program that provides opportunities to people who are underrepresented in free and open source software. Conservancy also improves software freedom generally by working on nonprofit accounting software and license compliance. USENIX is a not-for-profit member association of advanced computer scientists. We publish high quality, bleeding edge systems computing research at our vendor-agnostic conferences, and we champion open access by making that research free available to all. Our greatest strength lies in building collaborative, respectful, and diverse communities that bring together researchers and practitioners. DemocracyLab is building online infrastructure to empower the civic technology movement. We are creating an online hub for civic innovation that uses marketplace dynamics to allocate effort, resources, and attention. Our initial product seeks to optimize the connection between skilled volunteers and technology-for-good projects. Later offerings will focus on the needs of donors, citizens, and institutions. The result of our work will be increased participation, collaboration and transparency within the civic tech movement, and the evolution of new civic innovations capable of addressing society's significant challenges. DemocracyLab is a 501(c)(3) nonprofit organization. Our platform uses the MIT open source license. Founded in 2000, The Perl Foundation (TPF) is a non-profit 501(c)(3)corporation established to advance the use and development of the Perl programming language. By funding critical areas of Perl development, The Perl Foundation insures the continued growth and innovation of the language.